Pick Your Own Roma Tomatoes are available for picking on Labor Day Weekend - Saturday, August 31 - Sunday, September 1 from 6:00am to 12:00pm. The price is $.30/pound. We ask that you bring containers of equal size that will not hold over 50 lbs so that it will make them easier for weighing. We will also have boxes available for purchase for $2.00/box. 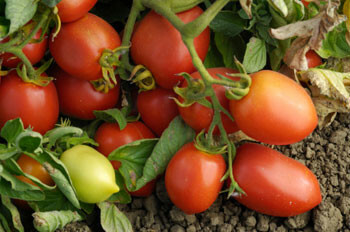 Pre-picked Romas are $.60/lb. These Romas must be ordered and pre-paid. Allow 1 day notice for orders of 50 lbs or more. Orders can be placed beginning on Friday, August 23. Please call (805) 529-3690. Cases of bell peppers will also be available for purchase. Plus - Basil will be available at checkout for $8.00 per 1 lb bag. Since the PYO Romas fields are outside of our Farm Center, there is no admission required to enter and pick. Please visit the PYO price page on our website for information on other PYO items within our Farm Center.